2014 – [With Reis Lloría], «Aigua, irrigació, hortes i patrimoni al territorio valencià», Millars, XXXVII, 17-34. 2012 – [With Enric Guinot], «La construcción del paisaje en una huerta feudal: la Séquia Major de Vila-real (siglos XIII-XV) », J. Torró, E. Guinot (eds.) Hidráulica agraria y sociedad feudal. Técnicas, prácticas, espacios, Valencia, PUV, 2012, 103-145. 2008 – [With Enric Guinot], «L’estudi del paisatge històric de les hortes mediterrànies: una proposta metodològica», Revista valenciana d’etnologia 3 (2008), 100-124. 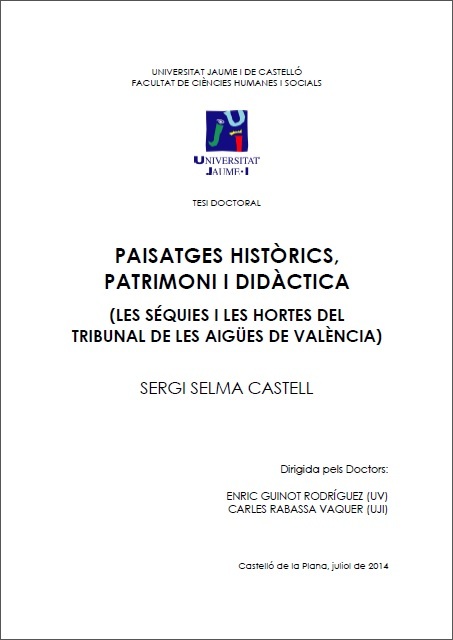 Title: «Paisatges històrics, patrimoni i didàctica. Les séquies i les hortes del Tribunal de les Aigües de València» // Title in English: «Historic landscapes, heritage and didactics. The irrigation canals (séquies) and the irrigated spaces (hortes) under the Water Court of Valencia». Abstract: Séquies and hortes under the jurisdiction of the Tribunal de las Aguas de Valencia (Water Court of Valencia), a subject relevant from historical, landscape, heritage and cultural perspectives, are here characterised, analysed and described in detail. The study is divided into three major thematic blocks, including the evolution of the historical landscape of the horta, the material and immaterial cultural heritage derived from its construction, and the didactics and resources involved in the imbrication of its study within the framework of social sciences teaching in the Spanish educational system. The archaeological and historical research carried out in the Horta of Valencia has helped to define these historical landscapes from a historical and archaeological perspective, while setting forth a methodological proposal for the analysis of similar spaces throughout the Mediterranean. The historical examination of séquies results in a full characterisation of hydraulic systems, including water catchment, flow distribution and even the use of water power. With reference to this, a glossary of terms describing the wide variety of hydraulic structures found in historical hortes in the Kingdom of Valencia, is offered. Once the cultural and historical criteria for the characterisation of historical and cultural landscapes (and their heritage implications) have been outlined, the didactic value and, more specifically, the potential of this resource for teaching are also defined.